Doors can also be locked and unlocked with the transmitter (or smart key). When closing the door, push the door by hand. Make sure that the doors are closed securely. 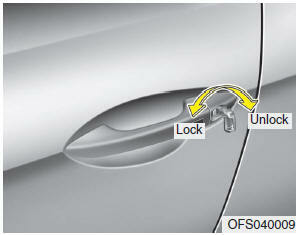 • In cold and wet climates, door locks and door mechanisms may not work properly due to freezing conditions. • If the door is locked/unlocked multiple times in rapid succession with either the vehicle key or door lock switch, the system may stop operating temporarily in order to protect the circuit and prevent damage to system components. The unlock mode is changed alternately by pressing the lock button and unlock button on the transmitter at the same time for 4 seconds or more. The hazard warning lights will blink four times to indicate that the mode conversion is completed. • If you don't close the door securely, the door may open again. • Be careful that someone's body and hands are not trapped when closing the door. If the power door lock switch does not operate electrically, the only way to lock the door(s) is with the ignition key from the outside key hole. 2. Lock doors by pushing each lock button. 3. Close the door securely. Once the tailgate is closed when the power door lock switch does not operate electrically, you will not be able to open the tailgate.